On Saturday, we went down the street to Lewis and Clark Heritage Days, an annual festival and reenactment focusing on the Lewis and Clark expedition which began just a few blocks from my home in May of 1804. Pj loves reenactments and looks forward to this event every year. The kids always have fun seeing the soldiers fire their flint locks and cannons and playing with the old fashioned toys. I love admiring all of the fantastic costuming and seeing the camps set up. It was a beautiful warm day and I wore my new confetti cat eye sunglasses and ric-rack skirt, which never gets worn often enough. We milled around the house all morning so I didnt have time for fancy hair. When time is short, I always go for a beehive or bouffant. After seeing Daffny's darling 60s flip, I tried it myself with my hot sticks. I loved how quick and cute the flip is. I think you'll be seeing this style frequently this summer! floral embroidered straw bag- estate sale? You look adorable! I absolutely love the bouffant flip on you, too, and the purse is gorgeously perfect to herald spring. Went went to a local re-enactment over the weekend as well and we always have a blast at those kind of events. My kids have fun every time, too. OHH! This looks like a magical day out! How beautiful is your bag too?! gorgeous! 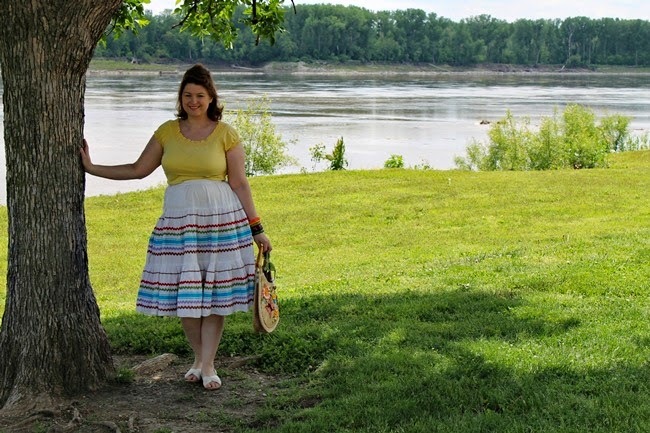 the patio skirt and the straw bag are wonderful. perfect for a little trip.